LONDON (Reuters) – Prime Minister Theresa May’s government won a confidence vote in the British parliament on Wednesday, clearing the way for her to attempt to forge a consensus among MPs on a Brexit divorce agreement. MPs voted 325 to 306 that they had confidence in May’s government, just 24 hours after they handed her Brexit deal a crushing defeat that left Britain’s exit from the European Union in disarray. May pledged to work with senior politicians across parliament to find a compromise that would avoid a disorderly no-deal Brexit or another referendum on membership. But critics said she was not budging from a deal that had alienated all sides of the debate. John McDonnell, finance spokesman for the opposition Labour Party, said May could eventually get a deal through parliament if she negotiated a compromise with his party. Labour wants a permanent customs union with the EU, a close relationship with its single market and greater protections for workers and consumers. But her spokesman said it was still government policy to be outside an EU customs union while May, an initial opponent of Brexit who won the top job in the turmoil following the 2016 referendum vote, insisted Britain would leave the bloc as planned on March 29, leaving little time for a solution to be found. 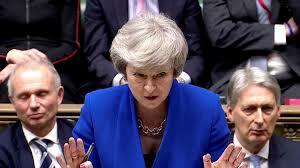 Yet Tuesday’s crushing defeat appears to have killed off her two-year strategy of forging an amicable divorce in which a status-quo transition period would be followed by Britain operating an independent trade policy alongside close ties to the EU, the world’s biggest single market. Labour leader Jeremy Corbyn said she was now leading a “zombie government”. Labour says its aim is to win power and negotiate Brexit on better terms. However, many Labour members want to see another referendum with an option to cancel Brexit, and the party says it is ruling nothing out if it fails to bring May down.